Big Pop Instrumental Solos contains 66 popular songs spanning 6 decades, providing a complete pop repertoire. 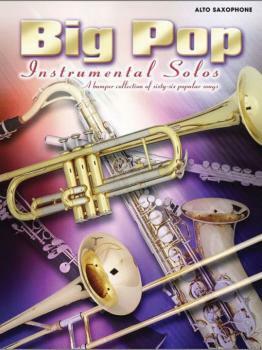 Includes classics from pop, jazz, film music, Broadway, and rock and roll. Titles: All By Myself * All the Way * Amazed * Anakin's Theme * Angels * Arthur's Theme * As Time Goes By * Bad * Beat It * Beautiful Strange * Beyond the Sea * Billie Jean * Blueberry Hill * Can't Get You Out of My Head * Careless Whisper * Days of Wine and Roses * Don't It Make My Brown Eyes Blue * Duel of the Eternal Flame * Evergreen * Family Affair * Fates * Flying Without Wings * Genie in a Bottle * Great Balls of Fire * Handbags and Gladrags * Hey Good Lookin' * House of the Rising Sun * How Do I Live * I Could Have Danced All Night * I Don't Want to Miss a Thing * I Say a Little Prayer * Just the Two of Us * La Isla Bonita * Livin' La Vida Loca * Misty * My Heart Will Go On (Titanic) * Nothing's Gonna Change My Love for You * Oh, Pretty Woman * On Green Dolphin Street * On My Own * Over the Rainbow * Papa Don't Preach * Rock Around the Clock * Saving All My Love for You * Smooth * Something About the Way You Look Tonight * St. Elmo's Fire * Star Wars * Still * Summertime * Tell Him * The Greatest Love of All * The Pink Panther * The Rose * The Way You Make Me Feel * Theme from Cheers * Theme from "New York, New York" * Time After Time * Tomorrow * Tonight I Celebrate My Love * True Blue * When a Man Loves a Woman * Who's That Girl? * Wind Beneath My Wings * Wipe Out * Without You.